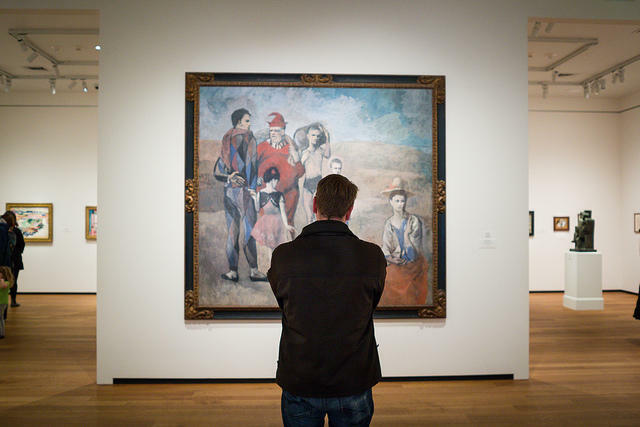 Visitor observing Picasso's "Family of Saltimbanques" at the National Gallery of Art. Many museums are seeking new ways to stay relevant and draw visitors -- in some ways expanding the very meaning of museum. These include hosting community events, commissioning neighborhood murals, pop-up exhibits, offering virtual tours and even responding to public crises such as the opioid epidemic. Alan Chong - Director and CEO of the Currier Museum of Art. John Stomberg - Director of the Hood Museum of Art. He is also a curator for the museum. Matt Wyatt - Co-chair, Co-founder, Rochester Museum of Fine Arts. The Currier Museum of Art -- originally called the Currier Gallery of Art when it was founded in February of 1919 -- is celebrating its 100th anniversary. Among The Currier's more recent ventures: "The Blue Trees," an installation by New York City-based artist Konstantin Dimopoulos, who colored the trunks of about 100 trees in Manchester. Director Alan Chong describes the museum's expanded mission: "We are planning new connections with our community," he says. The museum includes programs for Alzheimer's patients and those affected by the opioid crisis. "We are also thinking intently about our surrounding landscape, as well as our ties to Nashua and other parts of New Hampshire. The Rochester Museum of Fine Arts was co-founded by director Matt Wyatt, an artist who works in mixed-media and collage. Founded in 2011, the museum is located in the Rochester Community and the Rochester Public Library and has been active in helping to revitalize downtown Rochester, using vacant storefronts for "pop-up" art exhibits and commissioning murals. The Andrew Carnegie Gallery, located in the city's library, and The Mayor Harvey E. Bernier Room, located in the Rochester Community Center, feature the work of emerging and established artists. A survey by the National Endowment of the Arts finds an increase in museum attendance in recent years. Museum admission can be a controversial matter, as covered in this piece: Some argue that museums should have free admission. Others argue that paying a fee -- even if small -- might make people value museums more. With virtual reality tours, museums are sharing their works digitally, creating virtual museums.